There are systematic differences between SRTM and Jonathan’s 1 arc second data so plainly replacing void pixels with that data is going to fail of course. The USGS 1 arc second files contain bad quality void fill in some tiles that would need to be detected and removed for good quality results. The void filled 3 arc seconds data from the USGS/NGA vary strongly in quality of the void fill, in Europe they mostly just interpolate (slightly better than your gdal_fillnodata attempt but essentially similar). You can see that for example in your final image where the valley at the bottom appears dammed near Mollières. Here for comparison a rendering of my current basic processing in that area with OSM lakes flattened. Note this still has all artefacts of the USGS data in the non void areas included which are more difficult to address. The void filled 3 arc seconds data from the USGS/NGA vary strongly in quality of the void fill, in Europe they mostly just interpolate (slightly better than your gdal_fillnodata attempt but essentially similar). I agree with this; they’re quite evident when you see the hillshading layer. You can see that for example in your final image where the valley at the bottom appears dammed near Mollières. If by dammed you mean that smooth looking slope, yes, of course, I’m using less accurate data to fill that void. What I’m saying that this is the better I get from what I have. I would like to know which data are you using. I downloaded deFerrantis 1 arc for that region (http://www.viewfinderpanoramas.org/dem1/N44E007.zip) and indeed they look good in this region, but if you check the plains to the NE, you’ll see not nice terracing, like the one I showed in my post. There are also several vertical and horizontal ‘cuts’. Just run gdaldem hillshade on it to see what I mean. I prefer to balance a bit of accuracy for time saved (again, I’m not a professional cartographer like you, this is mostly for having fun… and useful offline maps in my phone) and better looking plains. (This is not the definite map; in that one, slope shades are too dark and confusing). I mean there is a barrier in the valley’s profile, the river seems to flow uphill. This is a very common side effect of simple interpolation void fill. I would like to know which data are you using. 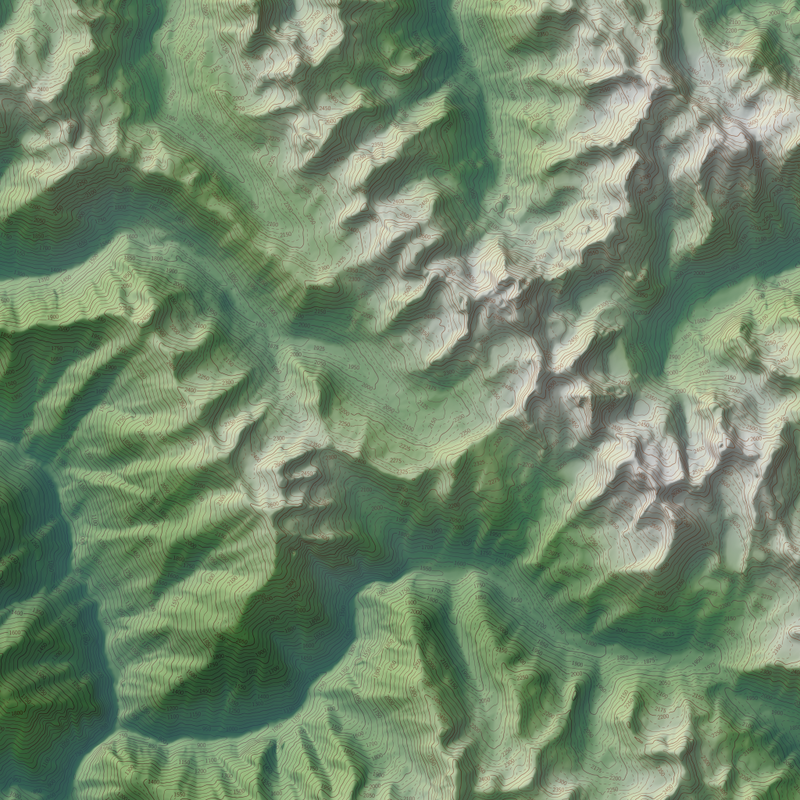 The shown image is based on the 1 arc second and 3 arc seconds SRTM as well as Jonathan’s data and OSM waterbody data. Flattening of lakes is to make sure the contours do not intersect the water areas.